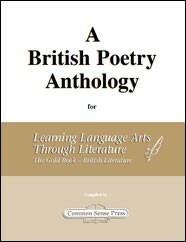 This anthology can be used in place of "The Mentor Book of Major British Poets", which is out of print. From Common Sense Press. *Contains Christian Content. British Poetry Anthology. This anthology has been compiled by Common Sense Press for use with Learning Language Arts Through Literature, The Gold Book - British Literature (Sold separately, item# 3763) This anthology can be used in place of "The Mentor Book of Major British Poets", which is out of print. From Common Sense Press. *Contains Christian Content.